Thabo Rapoo was born in Ga-Rankuwa, North-West of Pretoria on 19th September 1978. His dancing career began in 1997 with a Pantsula group, aMajita. The group incorporated acting with several forms of dance. In 1998, he met Tlokwe Sehume who invited Thabo to join his band, Medu. He learnt to play drums and percussion and in 2002 the band was nominated in three categories at the SAMA Awards. 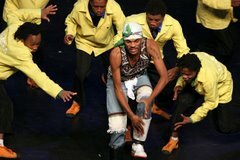 The same year, he auditioned for a scholarship at the Johannesburg Dance Foundation. He completed a three-year diploma in dance, which covered a wide range of styles, and was taught by the likes of Grayham Davies and Eugene Berry. He choreographed a solo for his graduation and also performed in the Arts Alive Festival in 2001. 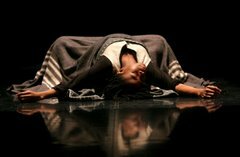 In 2002, Thabo entered two works in the FNB Vita Dance Umbrella. He subsequently performed his solo at the FNB Vita Dance Umdudo in Grahamstown in April 2002 and was invited to join MIDM as an aspirant. In December he conducted dance workshops in Francistown, Botswana, for the Botswana Music Camp, coordinated by David Slater. He was invited back in December 2003 and 2004. In 2003 he choreographed and performed a solo dance work, "Naga Ya Fsa" at the FNB Dance Umbrella, where he was also awarded Most Promising Male Dancer in a Contemporary Style for "Danceformation and Cementation". In November 2003, he was invited to take part in a Choreographic Residency initiated by the Dance Forum. 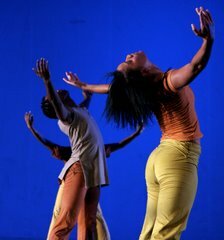 As part of this initiative he choreographed his debut work on the Company, which was staged at the FNB Dance Umbrella ’04. The work was selected for the FNB Pick of the Dance Umbrella Festival at the Dance Factory. He currently performs as a member of the MIDM Performance Company and assists Nhlanhla Mahlangu as an Arts & Culture teacher at Thuto-ke-Maatla Comprehensive.